Syrian regime forces, backed by massive bombing by Russian warplanes, cut a vital commercial supply route between Turkey and Aleppo, Syria's largest city. This route is used to provide food, medicines and other supplies to the more than 2 million people living in Aleppo. Already, tens of thousands are fleeing from Aleppo. Turkey says that there are already 10,000 refugees at Turkey's "door," stranded at the border crossing to Turkey, and 70,000 more are already on the way. The U.K.-based Syrian Observatory for Human Rights said that about 40,000 people have fled the region in the past few days. There are fears that regime forces will now move south and encircle and starve Aleppo, as the regime has done in Homs and other cities. In that case, there may be hundreds of thousands attempting to flee and head for Turkey. These are all new refugees that could enter Turkey and then attempt to reach the Aegean Sea and travel to Europe. Europe has in the past asked for Turkey's help in slowing the flood of refugees reaching Europe, and has promised financial aid for the refugees to encourage them to remain in Turkey. At an international Syria donors conference held in London on Thursday, countries pledged billions of dollars in aid for fleeing refugees. 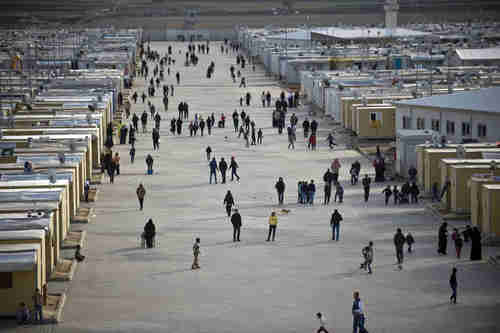 Germany pledged $2.6 billion in aid, the United Kingdom pledged $1.7 billion and the U.S. pledged about $925 million. What usually happens with these international aid conferences is that a lot of money is pledged, but the pledges are forgotten once the conference and the opportunity for publicity end. In this case, it's hoped that the pledges will be fulfilled, because it's the only hope of slowing the flood of refugees. "If the leaders of the international coalition unanimously decided to carry out such operations, the kingdom would be ready to participate in these efforts." Saudi Arabia is part of the US-led anti-ISIS coalition, and has carried out more than 190 aerial missions. It's also believed that the Saudis have previously supplied weapons to moderate rebel groups in Syria fighting ISIS. The use of ground troops has been hinted at in the past, but the latest announcement is formal and serious, the sources said. The announcement came after the so-called Islamic State (IS or ISIS or ISIL or Daesh) claimed responsibility for two suicide bomb attacks on Shia mosques in Saudi Arabia earlier this month, as well as several similar attacks last year. Nominally, Saudi troops in Syria would be fighting ISIS. Saudi Arabia is facing multiple crises, including a crash in oil prices, its principal source of revenue, and wars in neighboring countries in Syria, Iraq and Yemen. "Some try to malign Saudi Arabia by reciting that �15 of the 19� 9/11 hijackers were Saudi. They should know that the mastermind of the 9/11 attacks, Khalid Sheikh Mohammed, told US interrogators that the initial plan was to have 20 hijackers from different nationalities, but late in the planning Osama Bin Laden directed him to use as many Saudis as possible to give the attack a Saudi face. �Many countries have known the grief and pain [terrorism] causes. It makes no sense for Saudi Arabia to support or condone those who have as their goal the destruction of Saudi Arabia. It is against our values, our faith and our national character. That is why the Kingdom has responded with strength, persistence and resolve. To accuse the Kingdom of being lax, much less complicit, when it comes to combating terrorism and its financing is not only irresponsible but also flies against the face of reality." The spokesman for Russia's defense ministry, Major General Igor Konashenkov, says that Turkey is trying to conceal "illegal" military activity on its border with Syria. Konashenkov's unsupported claim is that Turkey is firing artillery into populated areas in the north of Latakia Province, and is preparing to invade Syria. According to Konashenkov, "The signs of hidden preparation of Turkish armed forces for activities in the territory of Syria we notice more and more."